We bought a new grill-pan yesterday. Non-stick, mais naturellement. Induction compatible. Competitive price. Couldn’t be better. Mrs. Paleovirtus and Paleovirtus Jr. couldn’t wait to test it out, and so a couple of nice slabs of entrecôte were purchased for that very purpose. Seasoned, oiled, minute and a half a side – you know the story. 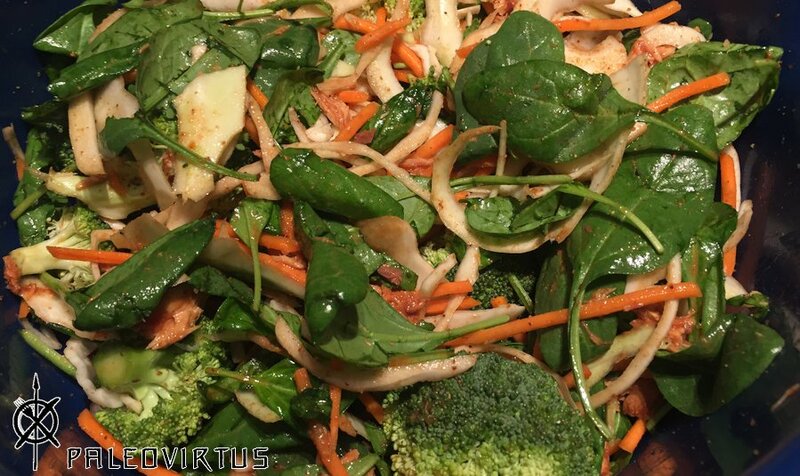 This entry was posted in Food Diary and tagged baby spinach, broccoli, cabbage, carrot, mackerel, paleo, raw vegetables, salad on November 2, 2014 by paleovirtus. Sometimes you can anguish all day about what to have for dinner, so that you end up going around in mental circles, suggesting and rejecting the same set of dishes over and over again. And then, pow! – inspiration strikes on the bike ride home. Chalk one up for the Zen of cycling. So, mes amis, here are 2 obscenely tasty salads that were super quick to prepare – I was finishing off my meal well under an hour after walking through the door. Dead easy, this one. 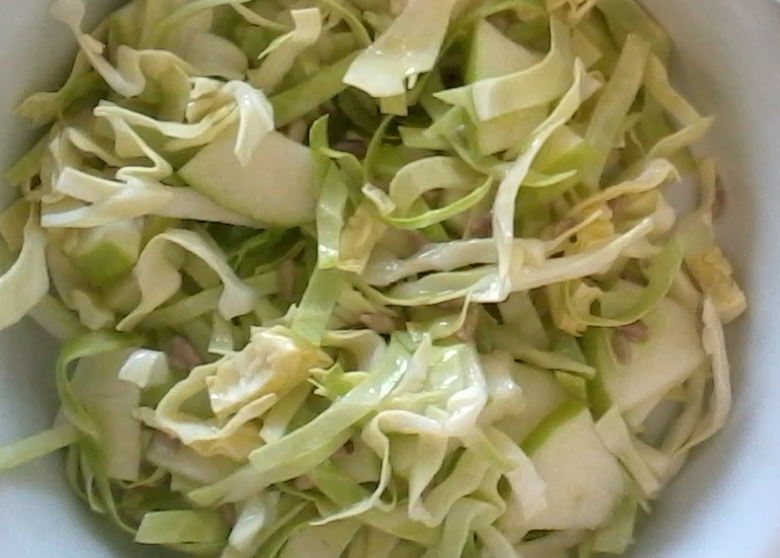 Simply shred the cabbage of your choice as fine as your equipment and skill levels allow, and core, segment, and finely slice the apple of your choice, too. Scatter over as many sunflower seeds as you feel comfortable with – any other seed or finely chopped nut would also work, I reckon. Mix well. 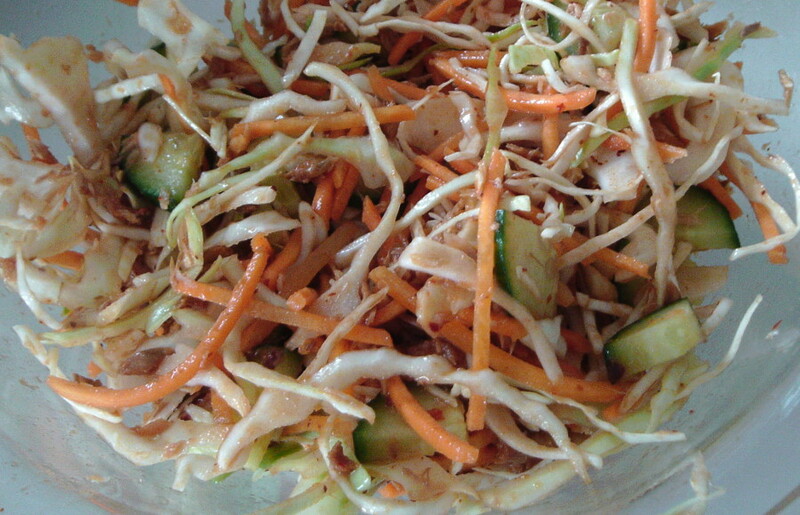 Dress with lime juice and sesame oil. Mix again. Season. Serve. 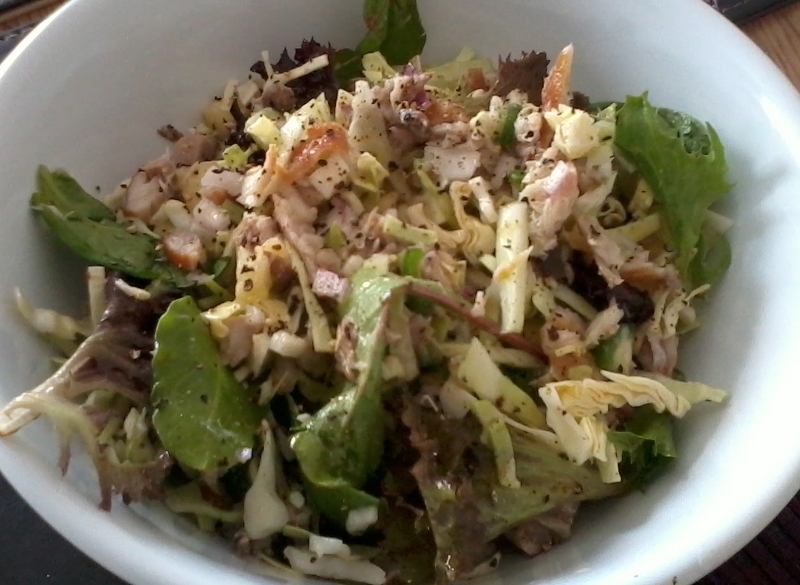 This one is only slightly more work than the first salad! Finely chop half a red onion. Into the salad bowl with it. Next in, 1 green chilli (be brave!) finely chopped. A good handful of pitted black olives should now be roughly chopped, and then in with them, too. Roughly chop a couple of tomatoes. Add to the bowl. Add capers to taste. Drain and then flake a tin of mackerel. Mix with the other ingredients. Dress with lime juice and olive oil. Season. Serve with whole, crisp, lettuce leaves – make lettuce leaves filled with the salad into “tortillas”. 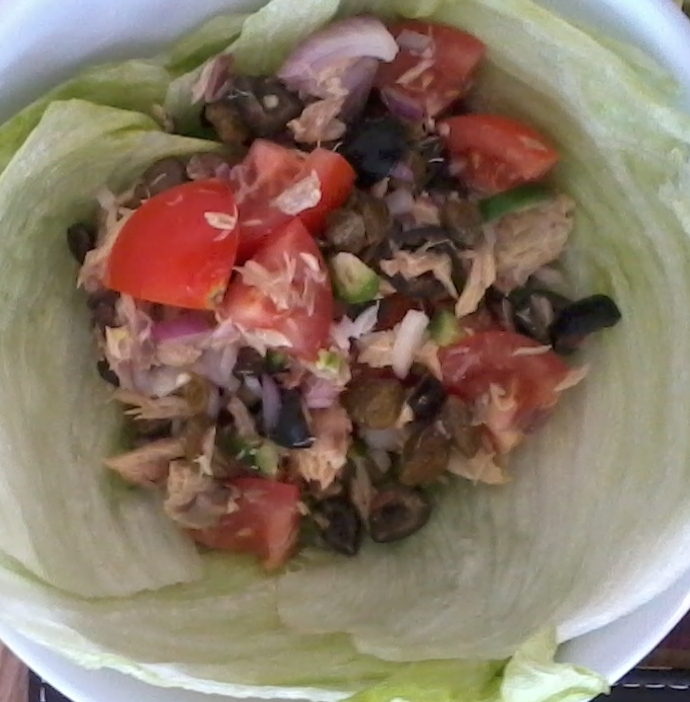 This entry was posted in Food Diary, Recipes and tagged apple, cabbage, capers, chillies, dinner, lettuce, mackerel, olive oil, olives, paleo, quick, salad, sesame oil, sunflower seeds, tomatoes on July 22, 2014 by paleovirtus.